(By CSZ Sports Writer Kenn Staub) Like the season, the Clarion Bobcat softball team is young. 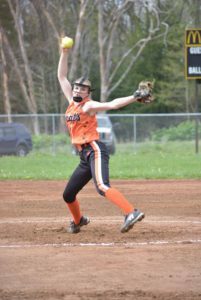 Head coach Dan Shofestall returns a mere six players, only two of whom are seniors, from last year’s 11-6 squad that advanced to the District 9 quarterfinals. Tori Vega takes a swing. As with any young squad, questions abound. In this case, the biggest questions surround who is going to play where. “We’re young experience-wise. Every position is up for grabs, so early on now we’re just battling for positions,” said Shofestall. Kaitlyn Constantino in the circle. “Pitching is coming along very nice, we like what we see so far. We’re making daily progress there, we’re getting better and better. You know we feel until we get our defense established behind our pitching, we’re looking for pitching to be our strong point in the year,” noted Shofestall. Junior Kaitlyn Constantino will assume the role of staff ace. Last season she posted a 3-2 record, striking out 46 in 32 innings of work. Also getting looks in the circle are freshmen Payton Simko, Noel Anthony, and Kylee Beers. Constantino also served as the team’s lead-off hitter a year ago, batting .466 and compiling a .563 on-base percentage (OBP). 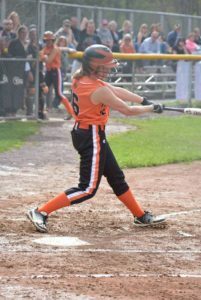 She drove in 13 and scored a team leading 25 runs in 17 games. Shofestall has identified junior Tori Vega, sophomore Brenna Campbell, and freshman Jordan Best as possible backstops. In 13 games Vega put together a .286 average and .545 on-base percentage (OBP), driving in six runs. Campbell batted .545 and had a .636 OBP, both team highs, plating 16 runs in 17 games. Lindsey Kemmer at the plate. 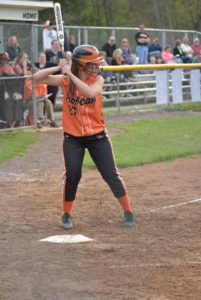 In 16 games senior Carly Best hit .362 and drove in 13 runs, while classmate Lindsey Kemmer batted .333 in 14 contests. Ava Kiser, a sophomore, played in seven games, batting .500 and knocking in two. Freshman MaKenzie Aaron and Jordan Best will also be seeking playing time and plate appearances. This season Shofestall is assisted by Randy Reynolds, John Stroup, Dave Constantino, Kaitlin Wenner, and Matt Best. The Bobcats are scheduled to open the regular season with a road game at Franklin on Wednesday, March 27.